Bulwarked Fortifications of the "Raia" (Border) is part of the Tentative list of Portugal in order to qualify for inclusion in the World Heritage List. This site contains four fortified places on the Spanish-Portuguese border. Most of them were built in XVIth century or after. Out of four location of this proposal, one is already on the main list (Elvas), so if the whole proposal is inscribed in this shape, for most it would be an easy tick. We managed to visit another one – stronghold of Almeida and it was one of our biggest surprises in this marvellous country. What stroke us the most is that the stronghold remained practically untouched for more than four centuries, despite the fact that there is still a living town inside. It means that the town can be accessed through several, quite narrow, historical gates. 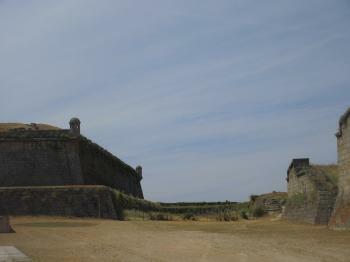 Stronghold walls, moans, ramparts are in the excellent condition and are really picturesque. Of course it all caused relative closure of the town and favored petrification of its architecture. Almeida is one of the nicest small towns we visited. I have never seen a complete fortified town like this and I think it justifies OUV of the proposal.